August 29 already, well it's getting to close to the end of summer already. That means that fall is just around the corner, I am sure hoping for a long warm beautiful fall. I'm not ready for any of that white stuff anytime soon. I made an inspiration card for my blog yesterday, I finally got to my scrapbook room to actually put a card together. I have all these images colored I just need to put it all together and that's one of the best parts at creating a card. 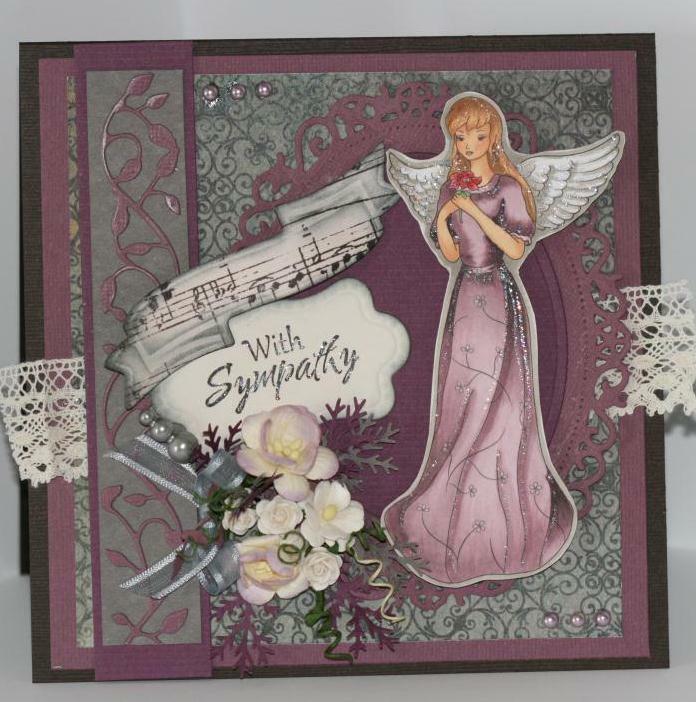 I really love how this card turned out.The angel stamp is a digital one from Whimsy Stamps called Angel Petals by Stampart Design. This angel looked so serene so I ended up making it into a sympathy card, not something I typically make . I usually just make birthday, just because cards, or never put a sentiment on it. But this one just maybe because of the colors I used, kinda pulled me towards making this with a sympathy sentiment which is from a Whimsy rubber stamp set called Butterfly Sympathy. I think while I was making this card I have been thinking of some of the people who I have lost that have and always will remain a big part of my life and who I am today. You know when someone has just touched your life and created memories that you don't ever let go of. Well I think that's where my mind was when I created this card. Not a sad thing just a calm, peaceful angel thing. I hope that I haven't made you sad by the theme that I have used but maybe just think about that someone who is watching over you as a guardian angel and smiling at you. I hope that you create something today that has all the passion and warmth that you deserve. Bless you and have a wonderful day. The angel with a bit of glitter on her. Stamps: Angel petals and Butterfly Sympathy from Whimsy Stamps. 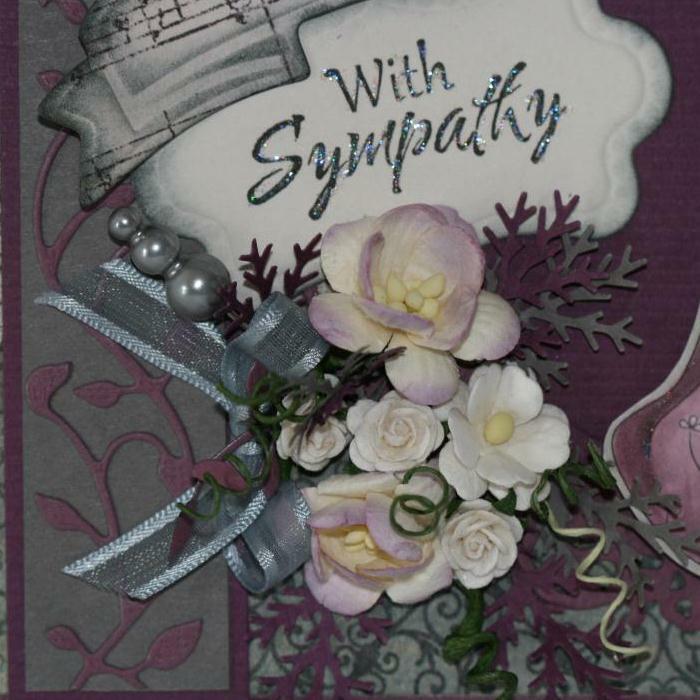 Dies: Spellbinders: Ribbon Banners & Twisted metal tags and accents, ovals, Floral Ovals & Memory box Delicate Vines. Embellishments:Whimsy flowers, Fab Scraps pearls, Maya Road stick pin, Ribbon, lace and distress ink. Love it, and nope not sad, just blessed...to have you in my world too...awesome job friend! WTG! 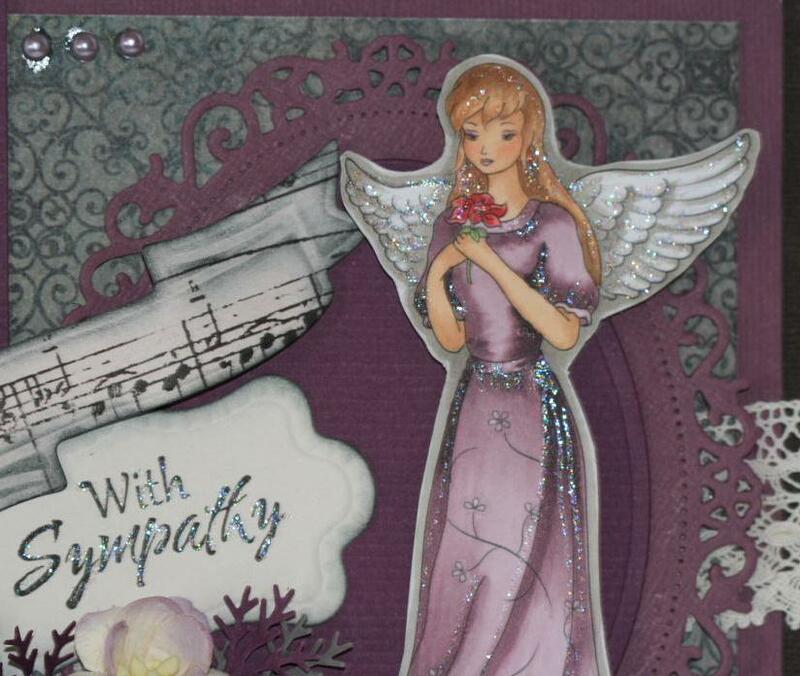 Love the color you picked...very calming...I love the glitter on the angel...nice touch! Awesome!